Located in the scenic Hudson River valley, 50 miles north of New York City, the U.S. Military Academy at West Point is a four-year academic institution and a nationally-renowned historical site. The undergraduates or "Cadets" become commissioned officers of the US Army upon graduation. As a military installation, West Point is a small, self-contained city. The cost of living for this area is high. The Basic Allowance for Housing (BAH) rates are higher at West Point than in other parts of the country. However, Soldiers assigned to West Point are not eligible for a Cost of Living Allowance (COLA). West Point's role in our nation's history dates back to the Revolutionary War, when both sides realized the strategic importance of the commanding plateau on the west bank of the Hudson River. General George Washington considered West Point to be the most important strategic position in America. Washington personally selected Thaddeus Kosciuszko, one of the heroes of Saratoga, to design the fortifications for West Point in l778, and Washington transferred his headquarters to West Point in l779. Continental soldiers built forts, batteries and redoubts and extended a l50-ton iron chain, known as the "great chain" across the Hudson to control river traffic. Fortress West Point was never captured by the British, despite Benedict Arnold's treason. West Point is the oldest continuously occupied military post in America. The mission of the United States Military Academy is "To educate, train, and inspire the Corps of Cadets so that each graduate is a commissioned leader of character committed to the values of Duty, Honor, Country and prepared for a career of professional excellence and service to the nation as an officer in the United States Army." The mission of the Garrison at West Point is " to provide equitable, effective and efficient base operations and community support programs that foster the well-being, safety and morale for all who live, work and play at West Point, New York. The Corps of Cadets consists of over 4000 future officers. In addition to the Corps of Cadets, West Point is home to active duty Soldiers and family members. Supporting the mission of the Academy and Garrison is a civilian workforce. West Point also services members of the National Guard and Reserves living in the local area as well as retirees. Population: The West Point student body numbers approximately 4,400. In addition to the Corps of Cadets, West Point is home to approximately 1,500 active duty soldiers and approximately 3,000 family members. Supporting the mission of the Academy is a civilian workforce of approximately 2,300 personnel. Take public transportation to Grand Central Station in New York City. Then take Metro North Railroad, Hudson Line to Croton-on-Harmon Station or Peeksill and a taxi to West Point. (There are closer stations but taxis may not be available, i.e. : Garrison Station). Reserving a Highland Falls taxi can ensure transportation to West Point. Stewart/Newburgh International Airport is the most convenient to West Point. Short Line Bus offers daily bus service from the New York City Port Authority, near Times Square in midtown Manhattan, to the West Point Visitors Center; one-way trip takes 1 hour 40 minutes and costs approx $15. Short Line also has day trip packages with sightseeing and local discounts. Take the Palisades Parkway north until it ends at the Bear Mountain Bridge circle. Proceed 3/4 of the way around the circle, following signs for West Point. You are now on Route 9W North. Stay on Route 9W for approximately 3 miles then exit onto Route 218 North. As you enter the Village of Highland Falls (travel approximately 2 miles) on Rt. 218, continue to bear right, which will bring you to the Thayer Gate of West Point. Autos without a DoD decal for West Point should access the installation through the Stoney Lonesome gate (open 24-hours) or the Thayer Gate (open 24-hours) from Highland Falls. Travel north on the New Jersey Turnpike to Exit 11. After exiting and paying the toll, get onto the Garden State Parkway North. Stay on the Parkway until it becomes the Thomas E. Dewey Thruway in New York State. Shortly after crossing the New York State border, follow signs for Interstate 87 South (Tappan Zee Bridge). You will stay on Interstate 87 South for several miles until exiting onto the Palisades Interstate Parkway northbound.See Directions for Palisades Interstate Parkway above. Autos without a DoD decal for West Point should access the installation through the Stoney Lonesome gate (open 24-hours) or the Thayer Gate (open 24-hours) from Highland Falls. Follow signs to the George Washington Bridge. Cross the bridge by way of the upper deck or level, getting into the right lane. Immediately after crossing the bridge, follow signs to the Palisades Interstate Parkway. Take the Parkway north approximately 37 miles. See Directions for Palisades Interstate Parkway above. 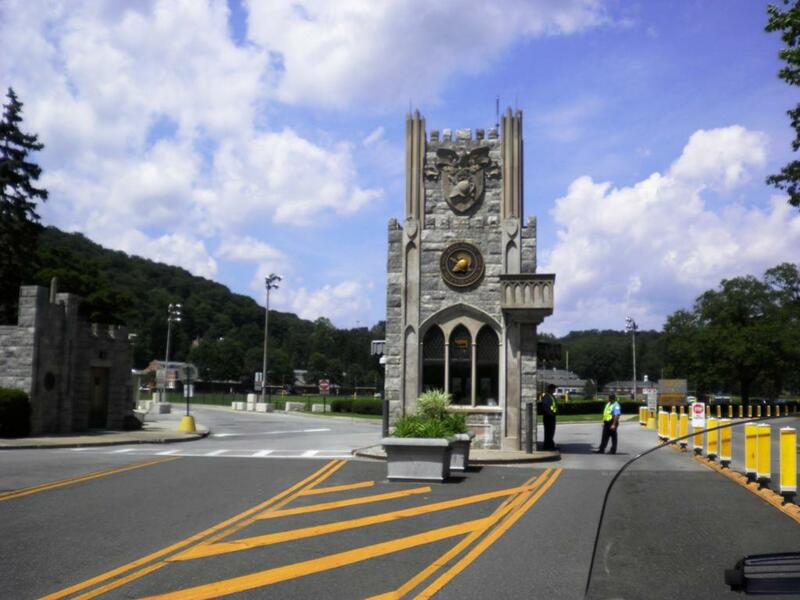 Autos without a DoD decal for West Point should access the installation through the Stoney Lonesome gate (open 24-hours) or the Thayer Gate (open 24-hours) from Highland Falls. Travel east on Interstate 80 to the Garden State Parkway exit (just past Patterson, New Jersey). Get on the Parkway North and proceed until it becomes the Thomas E. Dewey Thruway in New York State. Shortly after crossing the New York State border, follow signs for Interstate 87 South (Tappan Zee Bridge). You will stay on 87 South for several miles until exiting onto the Palisades Interstate Parkway northbound. See Directions for Palisades Interstate Parkway above. Autos without a DoD decal for West Point should access the installation through the Stoney Lonesome gate (open 24-hours) or the Thayer Gate (open 24-hours) from Highland Falls. Travel west on Interstate 84 until you cross the Newburgh-Beacon Bridge. Follow signs for Route 9W South. Stay on Route 9W for approximately 12 miles until you cross a large mountain. At the bottom of the mountain, exit onto Route 218 and proceed through Highland Falls and the Thayer Gate on RT 218. See Directions for Palisades Interstate Parkway above. Autos without a DoD decal for West Point should access the installation through the Stoney Lonesome gate (open 24-hours) or the Thayer Gate (open 24-hours) from Highland Falls. Turn left onto Route 207 East (Little Britain Road). Follow Route 207 through the first light at the intersection with Union Avenue (Route 300). At this point, Route 207 becomes Route 300/207 and is called Temple Hill Road. Follow Route 300 for approximately 3 miles until you come to the third traffic light. This intersection is known as "Five Corners". This is the intersection of Routes 300, 94 and 32. You will go across the intersection toward McDonald's and be on Route 32 South. Travel on Route 32 for a total of 1.7 miles. Immediately after passing over a trestle-type bridge, you will turn left off Route 32 onto Quaker Avenue toward Cornwall. You will see a green sign pointing to Bear Mountain and 9W South. Take this right hand exit. At this point you will merge with 9W South. Travel on Route 9W for 5.7 miles over mountainous terrain. As you are in your final descent, you will encounter the first of three exits for West Point. The first exit RT. 218/293 (not labeled West Point; after looping back under 9W onto Route 218) will take you by the golf course, through Washington Gate (entry allowed only if you have a DoD decal) and to Keller Army Community Hospital, West Point School, Eisenhower Hall and the area known as "The Plain". The second exit off Route 9W (Stony Lonesome Gate) is open 24-hours, and is the most direct exit to take you to the commissary, the post exchange, post gas station and shoppette, Stony Lonesome housing, the football stadium, and the Central Post Area. The third exit, open 24-hrs, will lead you through Highland Falls and bring you past Pershing Center (Visitors Center and West Point Museum), through Thayer Gate to the Hotel Thayer, 1-1 HQ, the bowling center, Army Community Service, the West Point Post Office and eventually the Central Area. Turn left onto Route 218 after passing through Washington Gate. Follow this road along the West Point golf course. At a "Y" intersection you will note a green sign denoting "Newburgh" or "New York City". Take the road leading to Newburgh. This road leads you onto Route 9W North. Follow 9W over several mountains for approximately 5 miles. After you descend off the final mountain you will look for the exit just after the "Angola Road" exit. At the end of the exit you will turn left onto Quaker Avenue (also marked as County Route 107). You will travel on Quaker Avenue not more than 1 mile at which time it will end at the traffic light at the intersection with Route 32. Turn right and travel about 1.7 miles on Rt. 32 arriving at the intersection known as "Five Corners" (this is the intersection of Routes 300, 94 and 32). At this point you should be in the leftmost lane to travel across the intersection going between Dunkin' Donuts and a Hess gas station. You will now be on Route 300 (also known as Temple Hill Road). Travel on Route 300 about 3 miles through three traffic lights. At the third traffic light, Route 300 will turn to the right. Ignore this. Continue going straight on Rt. 207 (Little Britain Road) passing under the Interstate 87/New York Thruway. Within a mile on the right, you will see the first of two entrances into Stewart Airport. No listings found for United States Military Academy - West Point.